Samantha has lived in Austin for over 27 years. She attended K-12 in the Eanes I.S.D. before graduating and attending the University of Texas at San Antonio on a full volleyball scholarship. There she received her B.B.A. in Marketing. Real Estate has always been in her blood, being a second generation Realtor she has had a lifetime of exposure to the business. While in college she worked for a custom home builder in sales and marketing and upon graduating joined her family's business. 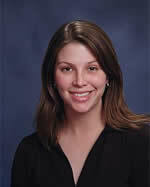 Samantha is a full time Real Estate Broker whose number one goal is your complete satisfaction. She specializes in new, resale and investment homes. She loves working with buyers and helping them find their dream home. She also works with sellers to market their property for the most money in the shortest period of time. She can offer you a complete marketing program which includes a current market analysis to price your property right from the start, a listing of your property in the Austin multiple listing database, eye catching and attractive yard signs and the unique Talking House technology. What is currently for SALE? What is currently for LEASE? Not ready for a house yet? Copyright © 2006 Eanes Properties All rights reserved.